Britain has launched Skynet 5B - the latest spacecraft in a sophisticated new military communications system. The satellite rode into orbit atop an Ariane 5 rocket from Europe's Kourou spaceport, in French Guiana. Over the course of the next month, 5B will take up a position over the Indian Ocean and begin handling secure traffic for UK forces around the world. The £3.6bn Skynet project is the UK's single biggest space venture and is designed to operate until 2020. 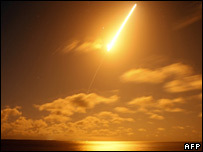 The rocket left the spaceport at 1906 local time (2206 GMT). It was a case of third time lucky after technical glitches had thwarted two previous attempts at a launch. The Skynet payload separated from the Ariane just 27 minutes into the flight and was soon picked up by controllers through a ground station in Africa. The spacecraft will need about 20 days of manoeuvres to take up a geostationary position at 53 degrees East. Skynet 5B joins the 5A platform which was launched successfully in March. Working together, the two spacecraft will provide near-global coverage. They will allow the Army, Royal Navy and RAF to pass much more data, faster between command centres. 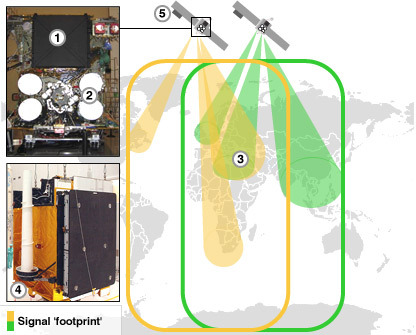 The bandwidth capacity of Skynet 5 is two-and-a-half times that of the old satellite constellation, Skynet 4. The new spacecraft have been "hardened" for military use. They will resist attempts to disrupt them with high-powered lasers, and have some capacity to ride out the electromagnetic pulse emitted by nuclear weapons - something that would knock out normal electronic systems. Classified receive antenna technology on the spacecraft can also go deaf to signals that try to jam communications, whilst at the same time leaving channels open for use by British commanders. The 5A platform is already making important contributions in Iraq and Afghanistan, the Ministry of Defence (MoD) says. The RAF's new Reaper Unmanned Aerial Vehicles (UAV) have begun monitoring Taleban operations, and 5A is being used to feed full-motion video back to the UK for analysis. UK forces expect more high-bandwidth applications such as Reaper to come online in the years ahead. The upgraded Skynet system is being funded with City money through a commercial company - Paradigm Secure Communications. 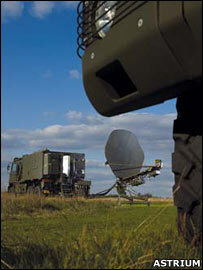 The firm now provides all satcom services to the Army, Royal Navy and RAF, including the "welfare services" that allow service personnel on tour to phone and email home. "The deal we have enables our customer, the British forces, to concentrate on what they are doing - the military campaign," said Malcolm Peto, the managing director of Paradigm. "They get better technology, faster; and we get more money because we're incentivised to invest in the technology. It's a virtuous circle. "The technology in our space industry is supremely efficient. In terms of the special bits that Skynet 5B's got for our military, it's just the best of the best." Spare bandwidth on the Skynet 5 system will be sold to Nato countries and other "friendly" governments, bringing revenue back to Paradigm and the MoD. Wednesday's Ariane rocket also lofted a Brazilian telecommunications spacecraft. The Star One C1 spacecraft will provide broadband internet services to South American consumers.